BS 8300:2009+A1:2010 is a British Standard published by BSI which came into effect on 28 February 2009 and incorporates amendments in 2010. The standard provides guidance on good practice in the design of buildings so that they are convenient to use by disabled people. The recommendations relate not only to the elements of construction and accommodation which are common to different types of buildings, but also to those that are specific to individual building types. BS 8300 is a code of practice which focuses on the design of buildings and their approaches to meet the needs of disabled people. 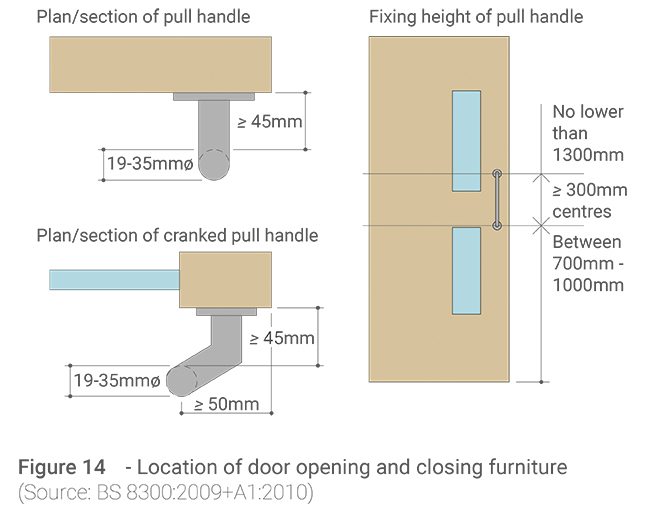 When specifying doors and the associated hardware, it is important to fully understand the recommendations of BS 8300 and the implications for the door specification. In some instances, recommendations are quite specific, whilst in others they include dimensional ranges. Where dimensions are stated, they are subject to tolerances. Dimensional ranges are intended to provide designers with some flexibility of design solution. Outlined below are the main areas detailed within the document which affect the door. - and does not exceed 22.5N between 30 to 60 degrees. 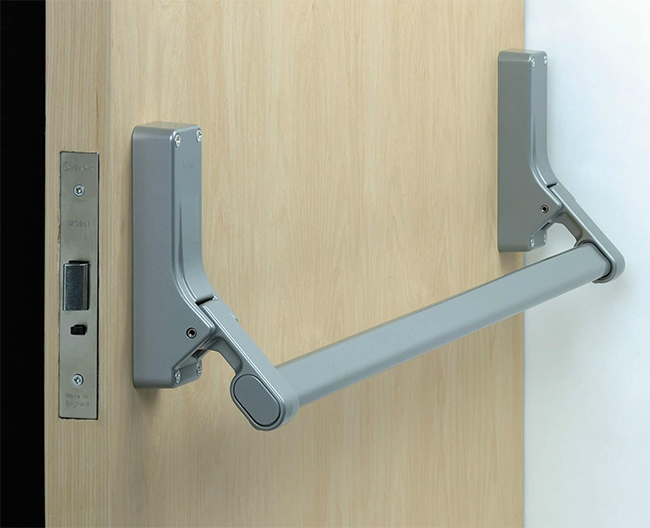 The choice of controlled door closing devices should take account of the efficiency of the closer, as well as the resistances from edge seals, hinge friction, latch resistance and differential air pressure. 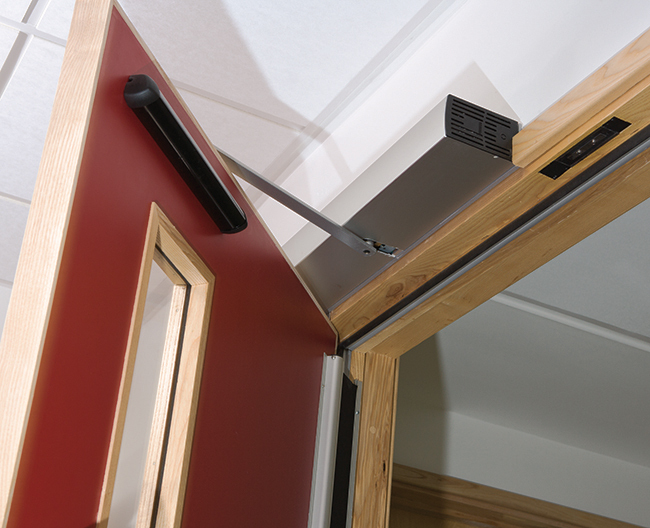 The use of high efficiency closers can reduce the force required to open the door and increase the proportion of the disabled population who can pass through independently. 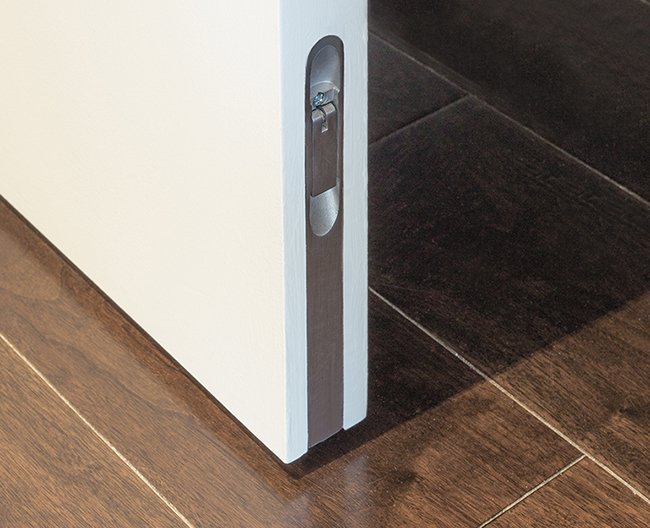 For assistance with specifying highly efficient closer mechanisms, please do not hesitate to contact Doorview. a) a power‑operated door (sliding, folding, balanced or swing). b) a low energy swing door. c) a power‑operated revolving door with an adjacent accessible door. d) an entrance lobby or airlock system of inner and outer doors. The minimum effective clear width of a single leaf door, or one leaf (the primary leaf) of a double leaf door, clear of any projections from the face of the door such as door furniture and weather boards, is shown in the table opposite. 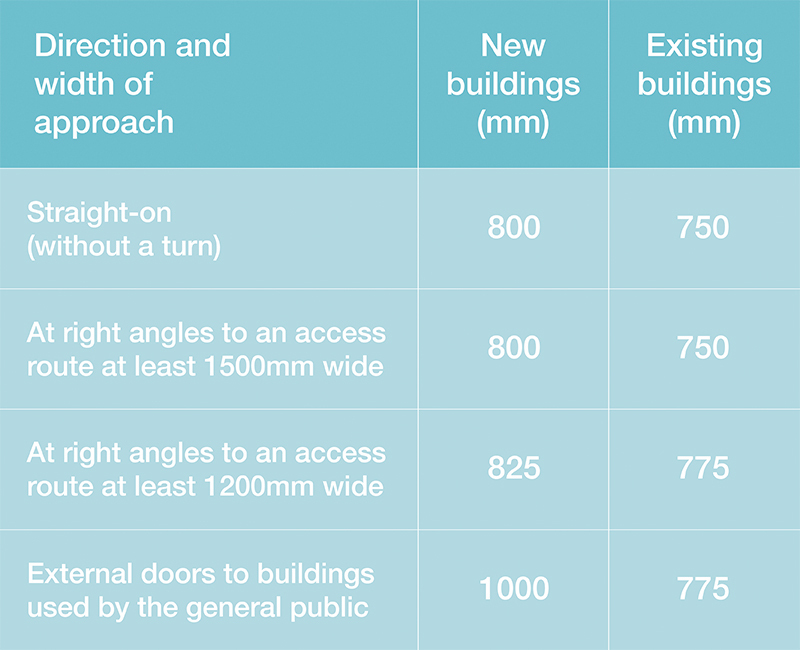 When specifying a door size, designers should take into account the extent to which the door might not be able to open beyond 90°, allowing for the projection of the door furniture or wall configuration. An unobstructed space of at least 300 mm should be provided between the leading edge of a door (when it opens towards you) and a return wall, unless the door is opened by remote automatic control. Increasing this space to 450mm will improve manoeuvrability, enabling wheelchair users to pass through the door more easily. It should be possible to operate all door opening furniture one‑handed, without the need to grasp or twist. 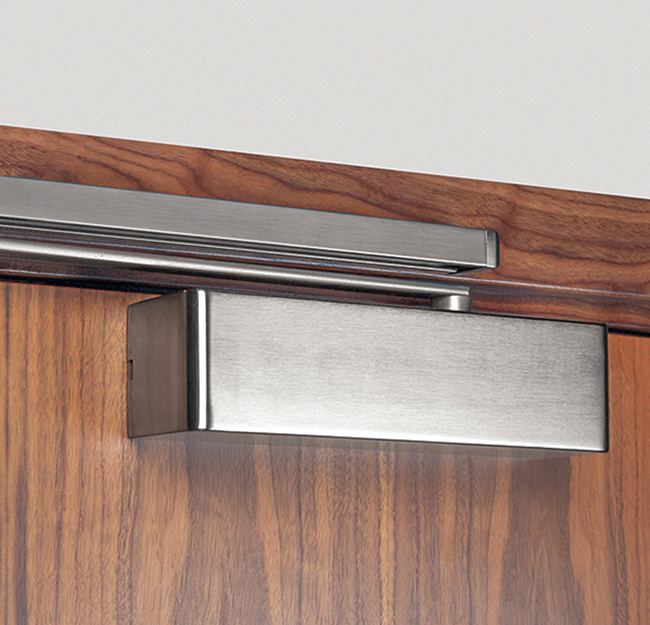 Wherever possible, door opening furniture used in conjunction with locks and latches should have a lever action. Knobs with a spherical, circular or similar design, as well as small symmetrical turn buttons, are difficult to use by people with limited dexterity, arthritis or a weak grip. For easy identification by blind and partially sighted people, all door opening furniture should contrast visually with the surface of the door (see Annex B). It is considered that a difference in LRV between the door opening furniture and the door of at least 15 points is acceptable. Where lever furniture intercepts viewing panels, any projecting glazing beads should not interfere with the operation of the lever or reduce the effective clearance behind it. NEED ADVICE REGARDING BS 8300? Pull handles should preferably not be fitted to the push side of doors. 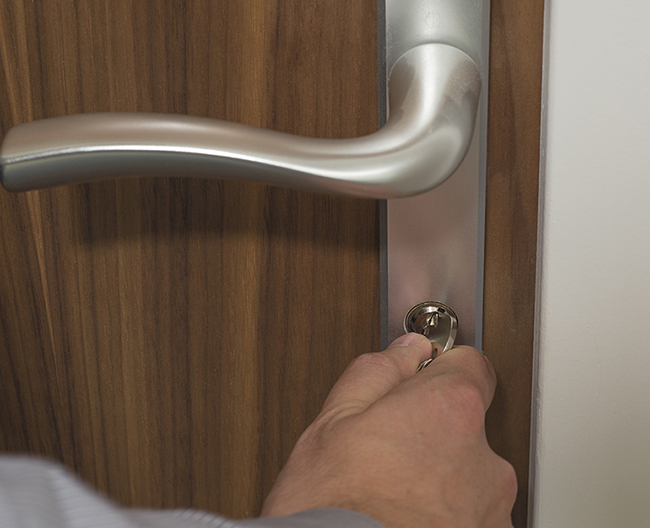 As with door furniture used in conjunction with locks, all pull handles should contrast visually with the surface of the door. It is considered that a difference in LRV between the door opening furniture and the door of at least 15 points is acceptable. - if the cylinder is below the handle, the minimum distance between the handle and the keyway of the cylinder should be 72 mm. Where a multi‑point locking system is used, it should be capable of being locked/unlocked simultaneously by a single turn of the key. 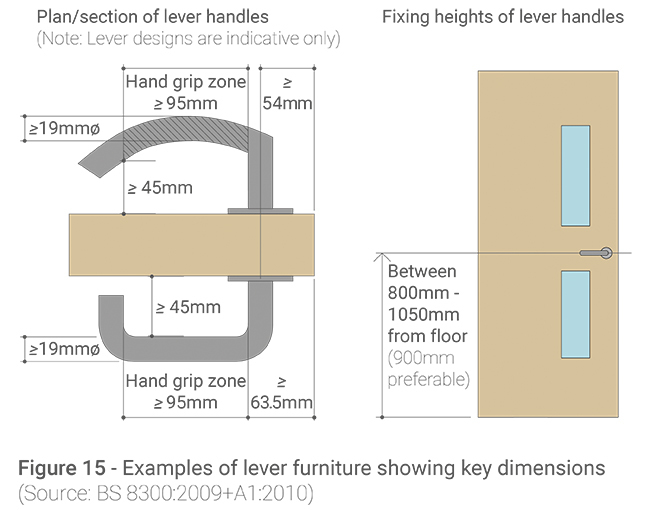 The operating height of the lever/pad handle should be that as mentioned in Figure 15(above). The torque force required to operate keys and cylinder turns should not exceed 0.5 N·m. Release forces for panic exit devices operated by a horizontal bar for use on escape routes should conform to BS EN 1125:2008, requiring an operating force no greater than 80 N.
Release forces for emergency exit devices operated by a lever handle (type A device) should conform to BS EN 179:2008, with an operating force no greater than 70 N.
Release forces for emergency exit devices operated by a push pad (type B) should conform to BS EN 179:2008, with an operating force no greater than 150 N.